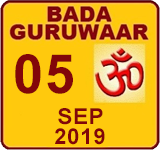 The Thursday that follows the night of No moon (Amavas) every month is celebrated and named as Bada Guruvaar. Everybody offers a Prasad of “Meethi Phuliyan” at Gurgaon sthaan. Seva starts at 5:15 A.M. in Summers and at 6:15 A.M. in Winters. Such is the power of Gurudev, that at the time of offering of prasad, anyone who makes a wish with a pure heart, gets what he wants in life. The “Shishyas” of Gurudev devote the complete day in Seva at the Gurgaon Sthaan. A prasad of “Khichri” and Tea is served to everyone. Gurudev’s disciples also visit Neelkanth Dham in large numbers.